Oswald Chambers constantly tried to follow what Paul spoke to Timothy, “And these things you have heard me say in the presence of many witnesses entrust to reliable men who will also be qualified to teach others” (2 Timothy 2:2). 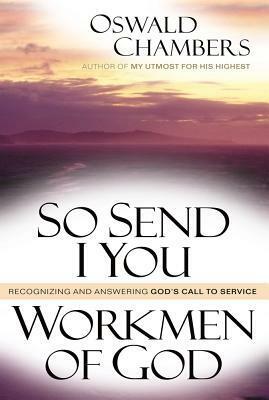 In Workmen Of God, we have a collection of lectures Chambers is giving to those “reliable men” and women who were either already working in pastoral ministry or preparing to do so. It’s amazing how Chambers could so effectively and specifically apply biblical principles to the audiences he addressed. For instance, some might think that those pastoring a local church and those ministering as a missionary would receive roughly the same sort of training. But a collection of Chambers’ lectures to those in missionary work (in his book So Send I You) has completely different ministry principles from the lectures he delivers to pastors in this book. If Chambers’ time was a time of rampant “soul-sickness,” how much more so do we need his insight today! Indeed, Chambers talks to pastors about their work among those entrenched in their unbelief, those who are skeptical, those who are backslidden, those who are hypocrites, and those who have sick souls. He also challenges pastors on how to minister to themselves so that they are prepared to minister to any soul in which God brings them in contact. Although written over 100 years ago, this book is still a treasure-trove for anyone in pastoral ministry today! « How Should Christians Handle Objections?